As I have been embarking on this journey of living healthier, I have been taking a look at the foods that I eat. I grew up in a family where food was one of the main focuses. It was used as a form of comfort, a form of togetherness and a form of love. It is also one of the most talked about topics when we do get together. Food was really more for enjoyment than it was for anything else. When I reflect on the foods that I liked the most, I realized that they weren’t the healthiest. For years I have been on a quest to find and create yummy foods that are healthy. Through experimentations (thank you hubby😉) I have discovered some new favorites and twists on favorites. 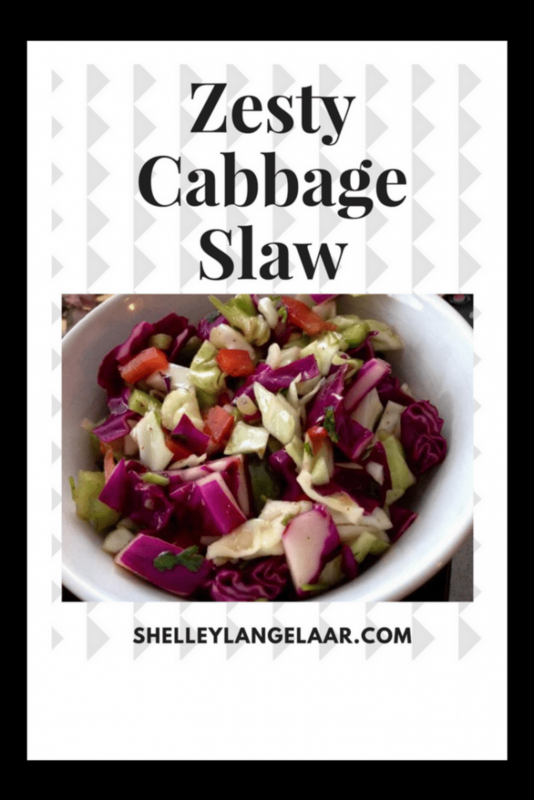 Today I want to share with you my recipe for “Zesty Cabbage Slaw”. Due to my issues with sugar I use a sugar substitute, however you can use regular sugar if you desire. Also note that this recipe includes cilantro – if you are not a cilantro fan do not run away. I have made this without the cilantro and it is just as yummy. 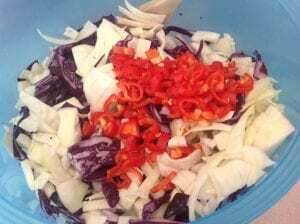 Cut up your cabbage, peppers and green onions and toss in a large bowl. Whisk agave (sugar,Splenda or choice of sugar substitute), vinegar, lime and oil in a small bowl. Add the dressing to the cabbage mixture and toss to combine. Add cilantro if using. Taste and adjust seasonings to personal taste. 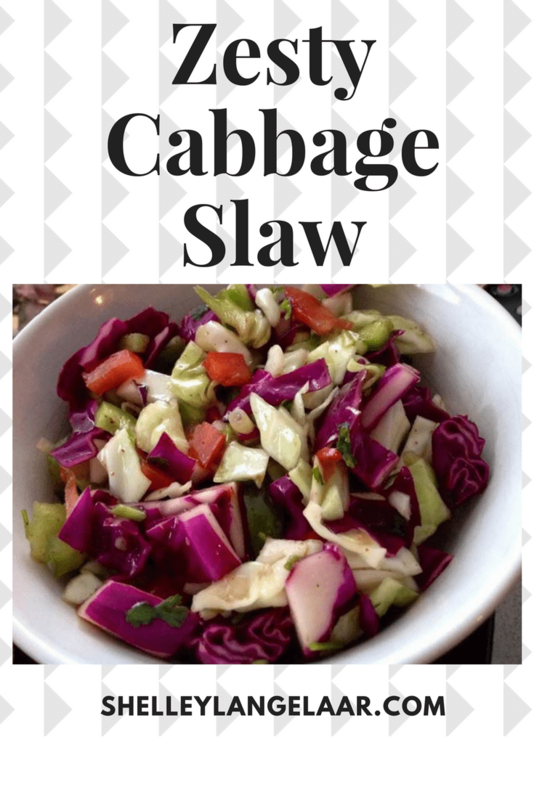 This slaw can be made the night before and keeps for several days. This is a great salad to take to a pot luck. I also will sometimes add some shredded cooked chicken breast for added protein. Let me know if you try it and your thoughts on it. Please note that I am not a nutritional or medical professional. I am sharing my own experiences and not advising. Nothing that I express should be taken as medical advice and you should consult with a medical professional before starting any diet or exercise plan. The reason that I am providing some of the nutritional information is as a courtesy. I use MyFitnessPal to calculate and I usually will remove sugar substitutes (erythritol, Splenda, swerve etc..) from the final carb count and net carb count, as it doesn’t affect my own blood glucose levels. I do my best to be as accurate as possible but you should independently calculate nutritional information on your own before relying on them. I expressly disclaim any and all liability of any kind with respect to any act or omission wholly or in part in reliance on anything contained in this website. This looks like a great side option for a meal! I am ALL about the zesty flavor profile! I love slaw, this looks really good. I will be trying it soon! This recipe looks delish! Will have to try it out. Yay! Cabbage is one of my fave veggies. I throw it in everything! I am a fan of cabbage too – both raw and cooked. 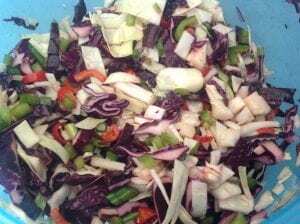 Such a lovely zesty cabbage slaw.. can try try and prepare.. looks colourful..
Look how colorful! I’ve always been told the more color you can add to your diet the healthier it is generally. This is super colorful and healthy looking. Oh yum, this slaw looks fabulous! I haven’t had a good coleslaw in ages, so I’ll have to make this! Oh now this sounds like an interesting recipe! I keep meaning to try more slaws and they can be such a great side dish! I’ll have to give this one a try. Great post. I like this twist on a traditional dish. Well done. I love dishes full of fresh veggies! This one is a keeper! I’m a big fan of slaw. This looks delish! I love the addition of chilli! The recipe seems delicious. I would try it on this weekend. I am a huge fan of a good cabbage slaw. This looks delicious I am going to have to give this a try. This looks delicious!!! Can’t wait to try it! I would love to try this. I love salads especially when it gets hot here. Yummy! Ooh looks lovely, will have to give it a go! Hi! Looks like a good recipe! I started keto life and cabbage slaw is a recomendation but with agave. Thanks for this and the photos! Now im hungry! I sometimes will make it with agave. It has a high carb count for me. I used to hate slaws but I have kind of grown to like them. But I like them now. This one does look delicious. Yummy and tasty recipe looks delish. I’ll have to mention this recipe to my Mom who loves slaw and likes bell peppers. I love making side salads with meals, I will definitely be trying your slaw out!! Please let me know if you do. Blessings to you. Such a versitile dish! It’s great to have some ready veggies in the fridge like this to add to or have on the side of meals. Healthy eating made easy! This looks so so good! I am a sucker for good slaw! It is a nice change from the classic coleslaw.